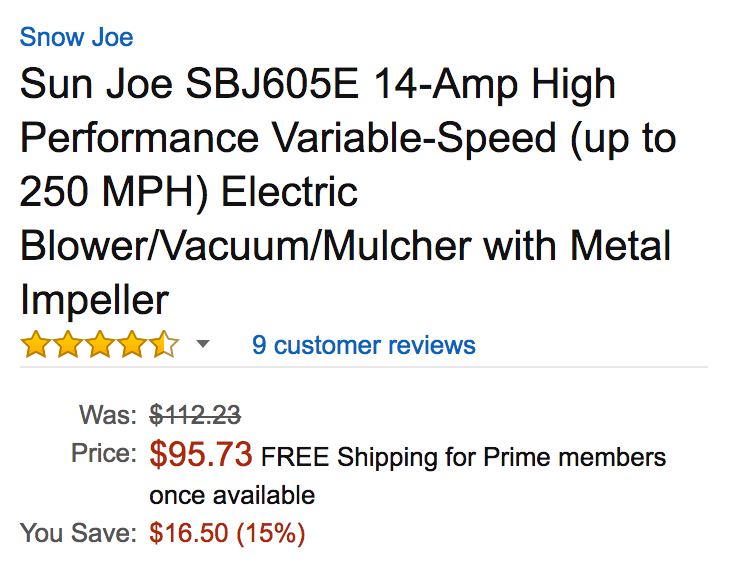 Amazon offers the Sun Joe 14A Electric Blower/Vacuum/Mulcher for $95.73 shipped. That’s down $20 or more from most online retailers and an Amazon all-time low. This blower is powered by a 14A electric motor that can push up to 250MPH of air at a time. It ships with a full two-year warranty. Sun Joe products generally receive excellent ratings at Amazon. Make light work of loads of leaves! Backbreaking lawn & leaf cleanups are a thing of the past. Lightweight, sleek & powerful, the Sun Joe Blower Joe 3-in-1 blower/ vacuum/mulcher packs the power of a hurricane in your hands to make your yard work fun, quick, & easy. Featuring an interchangeable tube design, the Blower Joe SBJ605E converts from a robust 250 mph blower to a mighty mulcher with a superior 16:1 mulching ratio – to make light work of even your largest leaf piles! With a cleaner, quieter 14-amp instant-start electric motor, you’ll leave your neighbors wondering where all the leaves went!